Hello you lovely lot. Welcome to another Read With Me. Can I just say, I am loving the mixture of posts that have been linked up and thank you to those that continue to link up each week. If you read my posts, you will know that my daughter's love reading just as much as I do. My eldest daughter is currently reading all of the horrible history books, do you remember those?? I used to read them when I was at school many moons ago. And last week my 6 year old daughter finally went up another level in her reading, this has meant her bringing home longer, more in depth books, something which I actually love. It is nice, as she has been reading to me more and more and it is lovely to see her progressing and learning more words and what they actually mean. Her current favourites are the Dr Seuss series, I think she may just know them off by heart now!!! 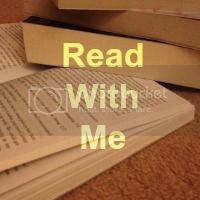 Any way back to the link up :) If you are new to #ReadWithMe, take a look right here to find out what it is all about. If you are a regular please now link up all your book related posts, comment on a couple of the other linkers posts and of course I would really appreciate it if you could grab my badge. As both a child and as a teacher I loved horrible history books!! Since I am from America, I love reading the way you say things differently than me. Thanks for this opportunity to learn about books that are worth reading. God Bless!